The many boutique shops that are lined up along Nehru Road and around the Mall are full of traditional Gorkhali & Tibetan ornaments, paintings and curios created by local artists and skilled artisans. All these shops mostly thrive on tourism. 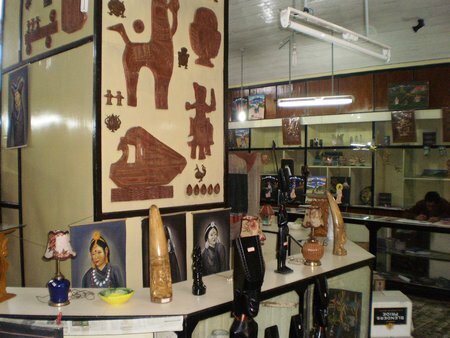 Some of the most popular items for tourists include elaborate earrings, decorative brooches, pendants and chains with colorful gems engraved on them, religious paintings also known locally as Thankas, curved Gorkha knives with cases know as Khukris, traditional boots, Tibetan masks and more. Thankas are scroll paintings typically created by the artists from Bhutia Busti which is located below the Mall. Each thanka is unique and depicts a tale from the Buddhist religious scriptures. The original ones are created using paper imported from Tibet and by using grounded stones with their natural colors. 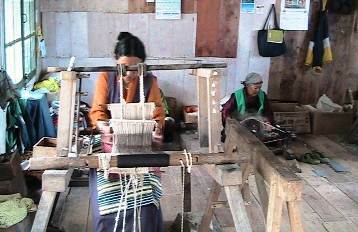 Other than trinkets and various types of jewelry and ornaments, some popular items include handmade bags, curios made on copper plates and studded with red an blue stones with impressions of deities on them, knitted woolens, Bhutia shawls & jackets, handmade intricate woolen carpets, and of course woodcraft and bamboo fret work. There are some special places in Darjeeling that have created names for themselves over the years in the area of art and handicraft. Here the ones that are our favorites. As apparent from the name of the center, it is run by Tibetan refugees who fled from their home country of Tibet as they followed Dalai Lama in 1959. Some of them took residence in Darjeeling. They had to survive in the new country and took up handcraft as the primary means to sustain their livelihood. Although they diversified their earning sources in later years, but since establishment of this center, Tibetan men and women have been making exquisite handicraft items here including woolen carpets, shawls, carved wooden crafts, leather items and more. Much of this is being exported. But if you visit their handcraft factory which is also their residential complex, you will get these items at the factory outlet called the Show Room. Tibetan Refugee Center is located on a hill top that can be accessed from Lebong Cart Road. If you are an art lover, you won't want to miss this one. This bright maroon and yellow painted building houses some of the finest artwork of late Ava Devi who was called the genius of embroidery work in Darjeeling. The artwork displayed here includes water paintings, oil paintings and even thread paintings. The gallery is located 4km away from the town center and on the main highway towards Ghoom. Manjusha is run by the West Bengal Handicrafts Development Corporation. It's a house of genuine handicrafts and handloom products of West Bengal. Items include wood carving, needle work, bamboo made items, silk sarees etc. It's located on Nehru Road and close to the Mall. Gram Shilpa is a showroom for Khadi and Silk handloom products. It has been set up by the Khadi and Village Industries Commission. Gram Shipa is also located in the Mall area. Established for a great cause to help the needy and poor women of the local community, Hayden Hall has grown since 1969 to run many programs that includes health, food, education, housing, income generation etc. for the underprivileged. It's hard to believe that women selected from the poorest of the families can be skilled to deliver such exquisite items like carpets, shawls, bags, purses, caps and more. There is an outlet called Hayden Hall Shop that sells all these hand made items. It's located on Laden La road and less than a minute walk from Gandhi Road junction. This is relatively a new art gallery and a retail outlet. It has great collections of Mahendra's own artwork. There are paintings from other local artists as well. The collections rotate with time and most of the artwork here are for sale. The gallery is located on the narrow road that originates from the Mall on the left and leads towards the TV tower. There is a nominal entry fee. 2) Darjeeling Tourist Places to know about many other great attractions.